It’s a little early — OK, more than a little — to draw conclusions on just how OS X Mountain Lion from Apple(s AAPL) might impact schools that use Macs. Still, Apple’s overview of their new desktop operating system makes such a strong connection to features borrowed from iOS, the operating system of the iPhone and iPad, that it’s a good idea to consider how Macs might fare in school environments where the iPad is now so popular that it is outselling the Mac. Many districts are rolling out iPad 1-to-1 programs (one iPad per student) where most, if not all, computing is done on iPads. By more closely integrating with iOS, OS X Mountain Lion should help in schools that make heavy use of iPads and still want to use Macs. Of the key features announced for the forthcoming Mountain Lion last week, a few technologies have significance for schools — some good, and some maybe bad. iCloud support is significant because it potentially reduces the IT infrastructure needed for shared document storage and backup of documents and device settings. Students will be able to share documents created on the iPad with a Mac, or even share back and forth. There are a few caveats, of course. You’ll need software for both platforms that can work with the same document. The iWork bundle is an example of software that can work on the same documents on both iPad and Mac. This could be great for situations where students have iPads but might need to hop on a computer to quickly paste in an image or chart created on the Mac. The downside to all this is that Apple didn’t really design iCloud for a shared computing environment like a school, so you’ll have to figure out how to allow access in your Mac lab. If we’re lucky, there might be something like the old iDisk where you could temporarily access a user’s documents, but I’ll assume that each student will need their own user account on the Mac to make the integration work. It could be great for a Bring Your Own Device program where students can bring their own iPad and Macs are available in the school lab. Gatekeeper is a new feature of OS X Mountain Lion that gives users more control over running only software downloaded from the Apple-run Mac App Store, software that has been signed by a registered developer (so you know the source), or any software at all. Gatekeeper sounds like it could be good for schools because it provides some restrictions against running untrusted software, but I suspect that most will continue to lock down apps by only allowing approved software from a centrally managed white list. Still, I like the possibility of a middle ground where non-IT folks could install the software they need for a class, or even just a certain unit for a few weeks, as long as it is from the App Store or signed by a registered developer. It would certainly help teachers avoid malware, but it doesn’t do much on its own to prevent kids from installing time wasters and games. You’ll still need to use admin accounts, permissions and profile manager or some other tool for that. Notes looks like it could be a great research tool and organizer for students working on a project. I like the idea of students collecting notes on their iPad and then pulling them together to write a paper or a presentation on the Mac. Of course, I’m still hoping that iCloud syncing of notes will be workable in schools. Reminders, a simple to-do list for both iOS and OS X, seems to fit right in with Notes and could definitely be useful, but only when integrated with iCloud syncing so students can make notes to themselves when working in the Mac lab and then pick up those notes and reminders on their iPad later. Share Sheets, Twitter, Notifications, Messages and Game Center are probably not on the top of the list for pedagogically sound uses of Macs in school, but I’m sure some creative teacher will surprise me. I suspect that most schools will be fighting with their IT departments to even allow network access to Twitter, let alone allow the students to access those features on the desktop. Messages, the new version of the iChat instant messaging application, could be a nightmare in some situations, especially since it allows for sending messages to iPhones, much like texting from the computer to a friend with an iPhone. Just one more thing to watch out for, I guess. Which brings us to the end of line with AirPlay Mirroring. Sweet, sweet AirPlay. AirPlay Mirroring allows you to display your screen to an Apple TV hooked up to a projector or a big TV in the classroom. Airplay Mirroring is going to be great for schools that are deploying an iPad 1-to-1 program. Not because we don’t have ways to hook up computers and iPads to TVs and projectors now, but because there will be a uniform method to do so that works across iOS devices and Mac computers that doesn’t require a variety of easily lost or misplaced adapters and cables. It also helps that this uniform method is wireless and relies only on a $99 Apple TV being installed in the classroom. I think teachers will be thrilled with the options available to share their desktop with the projector, switch to their iPad so they can walk around the room and still show their notes on the screen, and then let a student put their work up on the screen — all without plugging in a single cable or wasting time trying to find the adapter that was supposed to be returned to the projector cart or their desk drawer. None of the above-features are going to revolutionize education or create a surge in demand for Macs, but I do think that it will help tremendously in schools where iPads are being adopted. OS X Mountain Lion pulls together iOS and the Mac in a way that will make it easier for teachers and students to go back and forth with iCloud syncing (as long as you work out the policies and procedures to do that effectively), and AirPlay makes it dead simple to make use of projectors and big TV screens as well. The main problems I see for using AirPlay aren’t directly with Mountain Lion but with adding an Apple TV to an environment with only VGA projectors as well as the network usage of the streaming using AirPlay. I would be very interested in seeing how network intensive using AirPlay is. I think game centre would be a great tool in schools – Imagine interactive textbooks with achievements/ leaderboards for the class on maths apps … Think this is called gamification? 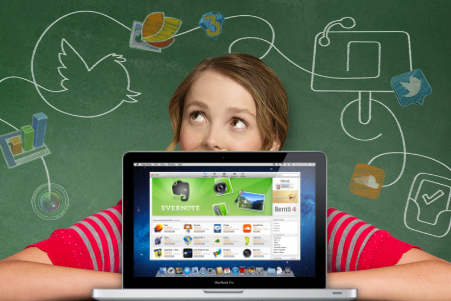 The advantages Mountain Lion offers well-heeled schools with 1-to-1 iPad programs may matter less to the education community than the fact that less endowed schools may find that their MacBooks bought a few years won’t run it. If not remedied, that may turn them off to Apple products in general.